Sisters Gerda Liermann (left) and Elfriede Harders are among a group of United Methodist deaconesses living in a retirement center in Hamburg, Germany. Each of the sisters has her own room. Amid the rubble of World War II, some Methodist women found calling and purpose in a life of service as deaconesses who ran hospitals, taught and worked in local churches and cared for the sick and aging in their homes. Now retired, several of the women reflected on the years that followed them “saying yes to God”— a yes that meant forgoing marriage and family and joining a community of women who took vows of service. The retirees still wear “habits” of simple blue dresses and white caps. Sister Gerda Liermann, 89, grew up in Poland but was among ethnic Germans expelled after World War II. She came to Lűbeck, Germany, as a refugee, where she trained as a baby nurse through the Methodist Church. Liermann wanted to be a deaconess, but wasn’t interested in nursing. She was initially told that her health, which suffered from lack of food and the trauma of war, was too poor for her to join the order. However, the Hamburg deaconesses told her she could live in the house and try to recover. In 1949, she was accepted as a deaconess and went to Berlin, where she was in charge of the men’s wing in the hospital. “The men taught me about football. I said, ‘You will listen to me when I talk about faith.’ They taught me about football and I taught them about God,” she said. In 1998, the Berlin hospital was converted to a nursing home and she was sent to Hamburg. Nineteen deaconesses live in the retirement home in Hamburg, some of them in long-term care. “That was very hard after living in Berlin for 43 years,” she said. 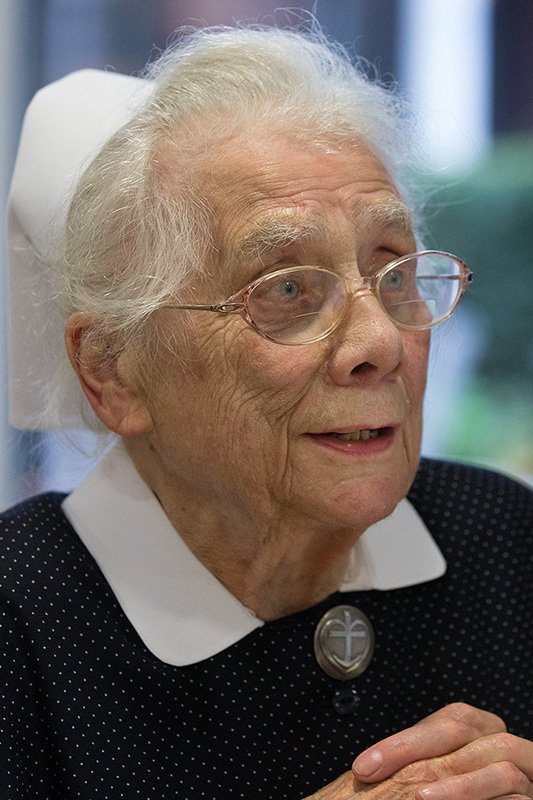 Sister Rose Häußermann, one of 10 deaconesses who live in a retirement home attached to the United Methodist headquarters in Frankfurt, served in a local church in Heidelburg. Häußermann spoke with United Methodist News Service a few months before her death in February 2018. She was the oberin, or matron of the Frankfurt sisterhood. She said she did everything, even sometimes acting as pastor and leading the congregation in worship. “I took care of the youth, the women’s circle, children’s worship,” Häußermann said, adding that she would ride her bicycle to visit and care for the sick. “The youth were beautiful,” she said, noting that it was common for the sisters to help run the churches. Sisters Lilly Groß (left) and Rose Häußermann enjoy lunch together at their retirement home attached to the United Methodist headquarters in Frankfurt, Germany. She really wanted to marry and have children. “But so many men died in the war,” she said. Her mother urged her to talk to a pastor about becoming a deaconess, while her father wanted her to marry. When women joined the order, they brought all their belongings to the order, said Groß, who remembered arriving by train with her two suitcases. “After the war no one had much money, but they brought what they could,” she said. All the deaconesses agreed that they had enough to have good lives in the communities that in some ways resembled Catholic convent life — a life that included friendship, faith and fun. The Rev. George Miller visits with United Methodist deaconesses in Frankfurt, Germany. Miller is a United Methodist missionary and has an office in the building where the sisters live. Sister Anita Hűbner, who was 19 when she became a deaconess, loved the work, especially nursing. Sister Christine Grűnert, at 73 one of the younger deaconesses in Hamburg, believes the sisters played an important role in the life of the church. “We offer the pulpit to the world. We were side by side with people. When people are sick they are more open to the Gospel,” she said, adding that she didn’t think she would have wanted to become a pastor. “I was always interested in reading theological literature but not as my main profession,” she said. She learned about deaconesses because her parents were members of the Methodist Church. She and other deaconesses said people today don’t want to live the simple lives of sharing property and giving up marriage and family. “They look for other ways of living,” Grűnert said. She went into private homes to care for the sick. The deaconesses were paid by rich people and cared for the poor for free. She applied to become a deaconess in Hamburg, but was not allowed to cross into what was then West Germany. So she was educated in East Germany, where she had three days a week of school and two of practical work. The deaconesses wear a pin that represents faith, hope and love. The cross is faith, the heart shape is love and the anchor is hope, Grűnert said. Sister Elfriede Harders, 90, said she was working in 1945 with a girl who could not return to Berlin, so she took her home to her family in East Germany, near the Baltic Sea. The girl had an aunt who was a deaconess in Frankfurt. In search of education, they came to Hamburg and were educated as nurses. “I became a Christian and a deaconess,” she said, adding that she joined the order in 1946. She recalled receiving her habit at the beginning of five years of probation. Although she trained as a nurse, she said she mostly worked in an office and overseeing other nurses. Sister Rita Seebach, a United Methodist Deaconess, welcomes visitors to her room in a retirement home in Frankfurt, Germany. Meeting these remarkable women who dedicated their lives to serving God and their community was one of the highlights of a visit to Germany. 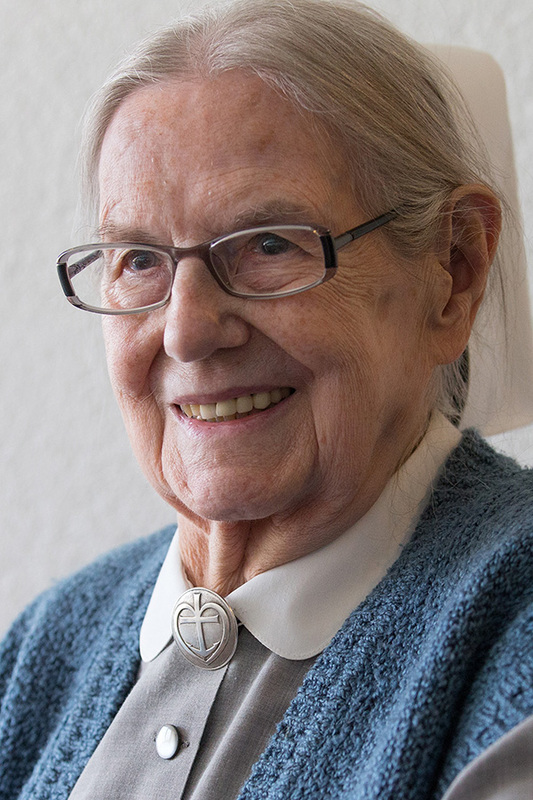 We would like to dedicate this story to the memory of Sister Rose Häußermann. — Vicki Brown and Mike DuBose. Brown is news editor for United Methodist News Service and DuBose is a photographer for United Methodist Communications. Contact them at 615-742-5470 or newsdesk@umcom.org. To read more United Methodist news, subscribe to the free Daily or Weekly Digests.